New babies are studies in perfection. 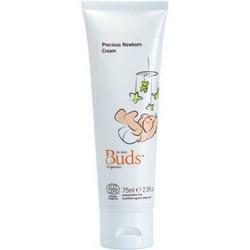 Buds Precious Newborn Cream is specially created for those first few months. Combining the benefits of JOJOBA OIL, SESAME OIL and SHEA BUTTER with INCA INCHI OIL to preserve and protect, this lavish cream is also boosted with soothing SPENT GRAIN WAX and ALOE VERA EXTRACT. OLIVE LEAF EXTRACT completes the cream by promoting skin hydration and providing potent antioxidants. Use daily to nourish and help newborn skin adjust to life on the outside.